I'm getting there.... I worked on this all weekend. Yes, really. 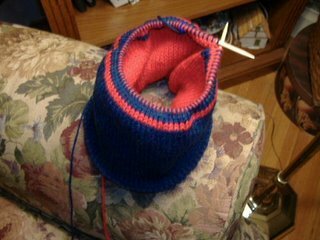 It's S-L-O-W. Only a grandchild who's head I will want to keep warm someday will entice me to do this pattern again. And I noticed something concerning that I've never noticed before. My hands ache when I work on this. I don't know if it's project specific or if my hands are going to hurt all the time when I knit now. I take enough ibuprophen for my back so I don't want to have to start taking it for my hands too! I watched Monster In Law while knitting last night. It's a cute movie if you haven't seen it yet. Jane Fonda is a hoot and Wanda Sykes as her assistant is great. I just LOVED J Lo's wedding gown in the end. It was gorgeous.